CATERHAM SEVEN 1.8 R500 NGK STANDARD SPARK PLUGS x 4 BKR7E  NEW IN BOX! Manufacturer Part Number: B8ECS. Make: CATERHAM. NGK SPARK PLUGS FOR CARS > NGK STANDARD SPARK PLUGS. Product Type: SPARK PLUG. Model: SEVEN. 100% SECURE. Product Version: STANDARD. List Price £ 23.36. Specifico per: CATERHAM Seven Super Sprint 1.7 99 kW. Le candele d’accensione a marchio NGK sono sinonimo di qualità, affidabilità e durata nel tempo. L'INSERZIONE SI RIFERISCE ALL'ACQUISTIO DI UNA (1) CANDELA. Make: CATERHAM. 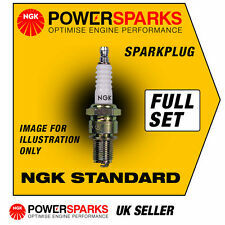 NGK SPARK PLUGS FOR CARS > NGK LASER PLATINUM SPARK PLUGS. Product Version: LASER PLATINUM. Product Type: SPARK PLUG. Ground Electrode Material: PLATINUM. Centre Electrode Material: PLATINUM. CATERHAM SEVEN 1.7 Spark Plugs Set 4x 90 to 95 TL17HT NGK. CATERHAM SEVEN (CF) 1.7 Convertible Petrol 01/1990 12/1995 RWD 16 135 99. Spark Plug Unscrewable SAE connector, Nickel Middle Electrode, 1 - Earthed Electrode, no interference suppression, with gasket seat. Specifico per: CATERHAM Super Seven GT 1.6 MOTORE FORD Kent S. Le candele d’accensione a marchio NGK sono sinonimo di qualità, affidabilità e durata nel tempo. L'INSERZIONE SI RIFERISCE ALL'ACQUISTIO DI UNA (1) CANDELA. Specifico per: CATERHAM Super Seven HPC 2.0 110 kW MOTORE Opel 16V 07/91-. Le candele d’accensione a marchio NGK sono sinonimo di qualità, affidabilità e durata nel tempo. L'INSERZIONE SI RIFERISCE ALL'ACQUISTIO DI UNA (1) CANDELA. 4 x lt 1.1 NGK IRIDIUM IX siete bujías a enchufes de chispa la CATERHAM HONDA Nº 6216. CONJUNTO de 4 iridio IX NGK bujías. ¡Amplia gama de nuevo NGK bujías! ¡Vendedor de Reino Unido! NGK SPARK PLUGS. BOSCH SHORT CODE: FR56. FITS MAKE: CATERHAM. BOSCH SPARK PLUGS > SUPER-4. SPARK PLUG TYPE: BOSCH SUPER 4 SPARK PLUG. FITS ENGINE TYPE: i 16V. Part Type: Spark Plug. FITS MODEL: Super Seven. Warranty Period: Manufacturer Warranty if applicable - See Bosch website for more details. Manufacturer Part Number: BCPR7E. Make: CATERHAM. Short Code: 1272. NGK SPARK PLUGS FOR CARS > NGK STANDARD SPARK PLUGS. Product Type: SPARK PLUG. Ground Electrode Material: NICKEL. Centre Electrode Material: NICKEL. Manufacturer Part Number: BPR7EIX. Make: CATERHAM. NGK SPARK PLUGS FOR CARS > NGK IRIDIUM IX SPARK PLUGS. Product Version: IRIDIUM IX. Engine Type: KENT. Centre Electrode Material: IRIDIUM. Product Type: SPARK PLUG. Bosch Super Spark Plugs FR5DC. NGK reference BCPR7ES 3330. Vauxhall/ Opel. Plug Type - Projected centre electrode insulator - Resistor. Pitch - 1.25mm. Spark plugs required x (?). Kadett 2.0 Eng,- 16 valve (x4). CATERHAM SEVEN 1.6 106bhp Kent NGK Bujías X 4 estándar BP7ES ! nuevo! Manufacturer Part Number: BP7ES. Make: CATERHAM. Short Code: 2412. NGK SPARK PLUGS FOR CARS > NGK STANDARD SPARK PLUGS. Engine Type: KENT. Product Type: SPARK PLUG. Model: SEVEN. 100% SECURE. CATERHAM SEVEN 1.6 84bhp Kent NGK Bujías X 4 estándar BPR7E ! nuevo! Manufacturer Part Number: BPR7E. Make: CATERHAM. Short Code: 1142. NGK SPARK PLUGS FOR CARS > NGK STANDARD SPARK PLUGS. Engine Type: KENT. Product Type: SPARK PLUG. Model: SEVEN. 100% SECURE. Make: CATERHAM. NGK SPARK PLUGS FOR CARS > NGK IRIDIUM IX SPARK PLUGS. Product Version: IRIDIUM IX. Centre Electrode Material: IRIDIUM. Product Type: SPARK PLUG. Ground Electrode Material: NICKEL. Model: SEVEN. Specifico per: CATERHAM Super Seven Sprint 1.6 MOTORE Ford Kent T. Le candele d’accensione a marchio NGK sono sinonimo di qualità, affidabilità e durata nel tempo. L'INSERZIONE SI RIFERISCE ALL'ACQUISTIO DI UNA (1) CANDELA.